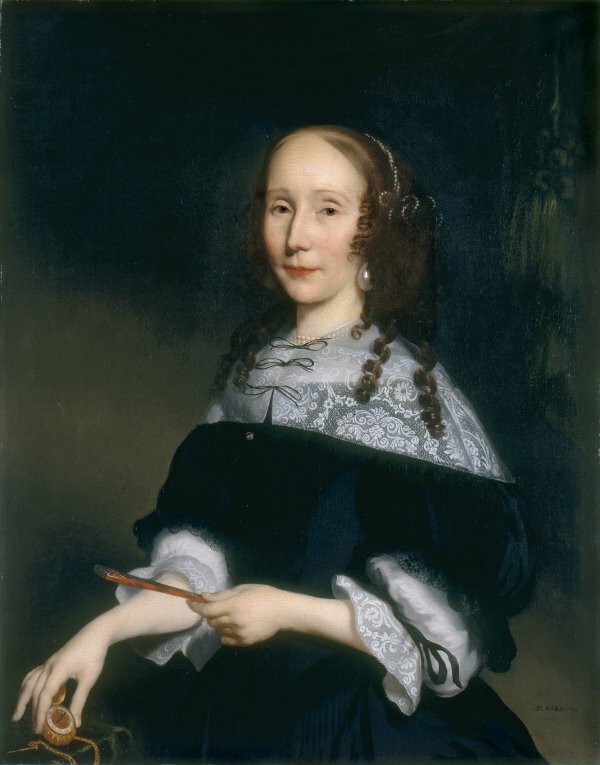 In addition to the interiors that he painted throughout the 1650s, Nicolas Maes also executed portraits, dedicating himself exclusively to this genre from 1660. He worked in various formats including the group and individual portrait, presenting his models full-length and half-length. His earlier portraits tend to use dark backgrounds with the sitters dressed and presented in an austere manner. This approach was modified in the 1670s when Maes adapted his style to the spirit of the times and located his models in refined gardens painted in light tones and with a freer brushstroke. In these later portraits Maes paid particular attention to gesture and pose, as well as to his sitters’ clothes and hairstyles. His portraits reveal the influence of Flemish and French art, a factor that contributed to their popularity. The present pair of canvases has a shared provenance. They belonged to William II of Holland and were acquired by Frederick, Prince of Holland, among whose possessions they figured until they were acquired by a dealer in Tutzing in 1927. They were subsequently with the Karl Haberstock gallery in Berlin, from where they were acquired by Heinrich Thyssen-Bornemisza. When the paintings were in the possession of William II of Holland they were identified as portraits of Cornelis de Witt and his wife. However, as Gaskell noted, these sitters do not in any way resemble the images of De Witt and his wife in the canvas by Cornelis Bisschop entitled The Regents and Regentesses of the Dordrecht Hospital. When the canvases entered the Thyssen-Bornemisza collection in 1930 they were identified as portraits of Jan van de Poll, Burgomaster of Amsterdam, and his wife, a hypothesis rejected by Ebbinge-Wubben given that Jan van de Poll was around 70 when these portraits were painted. That author suggested that the male portrait depicts Van de Poll’s son, Harmen van de Poll, Secretary to the Amsterdam City Council in 1661, and his wife. Gaskell rejected this identification and preferred to describe the two sitters as anonymous. The two canvases correspond to the style of a group of portraits painted by Maes in the 1660s which all deploy dark tones. The couple, of which the man is seated and the woman standing, are richly dressed despite the rigorous black of their clothes. Details such as the delicate lace at the woman’s wrists and neck, the fine, large pearls in her ears and the cloth of the man’s clothes, all indicate a society whose tastes were changing and which now displayed its prosperity more overtly. Gaskell drew attention to some differences between the technique of the two canvases as well as a slight difference in the scale of the models and in the treatment of the shadows that model their faces. He also noted that despite the fact that they are a pair, both canvases are signed. He thus suggested that they might have been painted some time apart, even though they were conceived as a pair, as the shared green curtain behind the figures indicates.